4 Course Dinner with Wine for two people at our ‘Piano Bar Supper Club’, Friday Evenings April – June 2015. 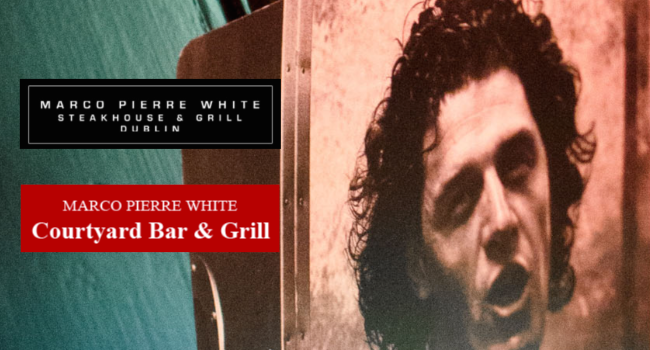 With this exclusive offer from TheTaste.ie you can enjoy our Marco Pierre White Supper Club Experience. The offer includes a delicious four course meal for two with a bottle of wine at our Piano Bar Supper Club evenings, Fridays – April to June 2015 for only €75. At Marco Pierre White, Courtyard Bar & Grill, Donnybrook, old school glamour, proper service and classic dishes are on the menu. When you walk in to Marco’s, accessed through a beautiful courtyard garden, you know you’ve signed up for more than just a decent dinner. Add to that, our live Piano Bar and a night on the town in Donnybrook is complete. Our menu comprises a choice of starters including our most popular items of Salad of Beetroot with Ryefield Goats Cheese and walnut dressing, and our signature Shrimp Cocktail with toast Melba. Marco Pierre White Donnybrook has also introduced some new additions to their wine list which they have recently sourced directly from La Croix Belle, a leading estate in Cotes de Thongue appellation. La Croix Belle is a 200 year old family property in Puissalicon, north of Beziers, between the Cevennes mountains and the Mediterranean”. The Setting? An opulent Room, you’ll feel at home in….only better. The Food? Simple elegant dishes using the finest ingredients. Experience the Marco Pierre White Supper Club Experience for yourself! When you walk through the doors into the lush cloistered gardens and heated terrace of Marco’s new Donnybrook restaurant Courtyard Bar & Grill into the relaxed luxury of the smart, inviting rooms, you’re met with a warm welcome. From the professional, genial front of house to the galvanized kitchen brigade, the team at Marco’s restaurants is united in their intention to make your meal an occasion. The chefs have earned their place in the kitchen, trained by Marco in one of his London restaurants. The waitstaff is friendly and professional, instinctively anticipating your needs, under the watchful eye of experienced managers. At Marco’s, you’ll notice the details, from the inventively curated music set list to the flatteringly seductive lighting. Marco’s is about service. Each member of Marco’s team is carefully chosen and meticulously prepared, and genuinely love their vocation. Marco began his classical training under Albert Roux and Michel Roux at Le Gavroche. At 24 Marco became head chef and joint owner of Harveys with a kitchen staff that included the young Gordon Ramsay & Heston Blumenthal. Dubbed ‘The Godfather of Modern Cooking’, Marco became the first English chef to win 3 coveted Michelin stars at the tender age of 33. Tucked in behind a vine gate on Donnybrook’s Belmont Avenue, Courtyard Bar & Grill is close to Aviva Stadium, The RDS as well as The 4 Seasons Hotel, Herbert Park Hotel and The DoubleTree at the Burlington. – Vouchers for the Supper Club are valid for Donnybrook only, for Friday’s only, from now to June 26th 2015. – For vouchers to be accepted, a reservation must be made in advance mentioning that you have purchase from TheTaste. – Vouchers must be presented on arrival. – Vouchers are valid on Friday evenings only from 5.30pm. Music commences at 9pm. – 4 course dinner includes choice of starters, mains, dessert, tea/coffee from their TheTaste menu plus a bottle of wine. – There is no service charge. Gratuity is at your discretion. – Bottle of wine is a choice of La Croix Belle Sauvignon Blanc Chardonnay or La Croix Belle Merlot.